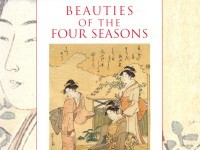 A full catalogue of the Ashmolean’s collection of Japanese bijinga (beautiful women) prints by Mitsuko Watanabe (published Oxford, 2005). In this print a woman is kneeling down holding a child, and another is standing outside on the veranda. There is a chrysanthemum bonsai behind the shōji tsuitate (a free-standing screen) in the cheerful mood of autumn. In the Edo period, gardening became very popular. The chrysanthemum was among the first plants introduced into this new fashion. There were even kikuawase in which people showed their own chrysanthemums competing for the most beautiful chrysanthemum to be seen that autumn. The stamp on the bottom right is the unidentified mark of a publisher. There is a series called Fūryū Shiki no Asobi published by Tsurushin during the Kyōwa period (1801-4) very similar to the present series. Bequeathed by Oswald J. Couldrey, 1958. Nishiki-e literally means 'brocade pictures' and refers to multi-coloured woodblock prints. 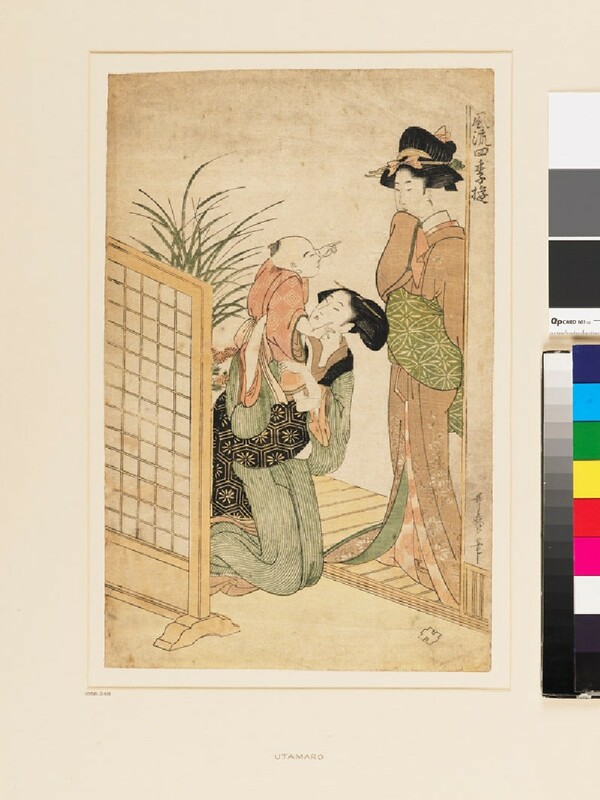 Vegetable pigments were used to create coloured dyes for Japanese prints, paintings, and textiles. These pigments often faded over time due to the chemical reactions they underwent.